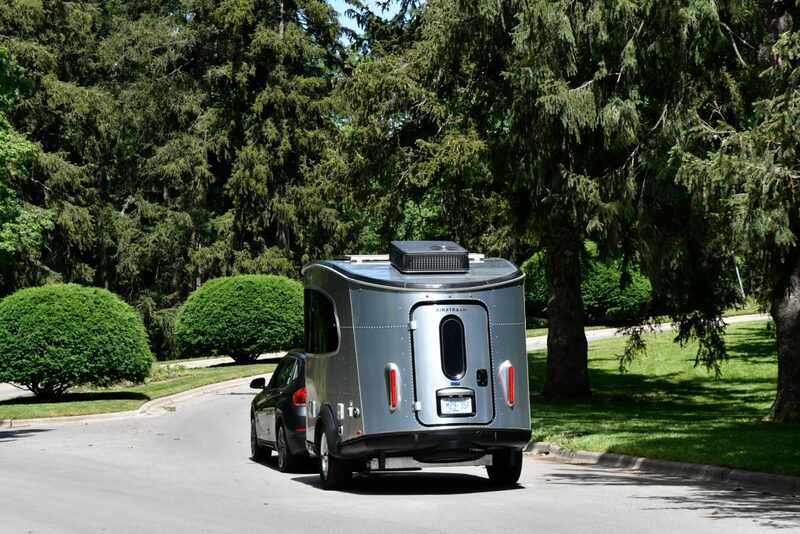 An Airstream for All Your Adventures! Text and Photos by Norm Rosen. 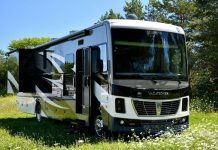 At RV Lifestyle Magazine, we have had our eye on the Airstream basecamp travel trailer for several years, just waiting for an opportunity to hitch one up to an SUV and hit the RV roads to adventure. 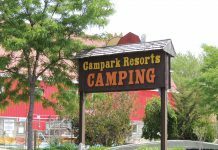 This opportunity occurred recently, when we checked out the Basecamp at Can-Am RV Centre in Lambeth Ontario, just west of London. Our test vehicle was hitched to a BMW X1 compact SUV, powered by a 2.0-liter turbo four-cylinder that cranks out 228 hp and drives either the front or all four wheels through an eight-speed automatic. 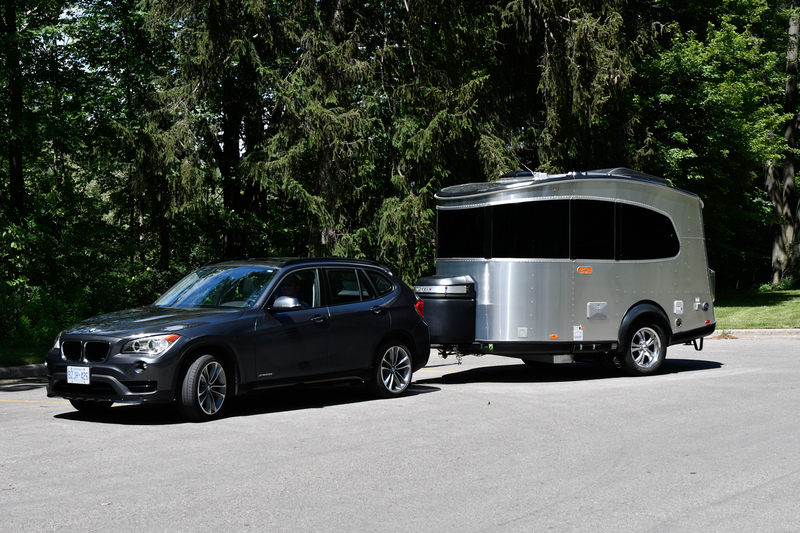 Needless to say, the BMW towed the trailer like a champ – it had lots of power to pull the 2,585 lb./ 1172 kg trailer, and with a class III equalizing hitch we experienced zero sway, roll, or yaw on the curving roads of south-central Ontario. Large 18” stylized aluminum wheels and Goodyear® Assurance tires help the Basecamp traverse rough terrain, and the Torsion Axle suspension smooths out the ride. The Nev-R-Adjust® brakes are smooth and confident. 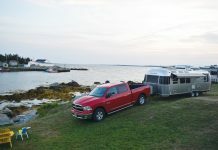 The first Airstream Basecamp model rolled off the production line in 2007, and the design has been refined over the past decade to the point where the 2018 models represent a state-of-the-art iteration of the original concept. 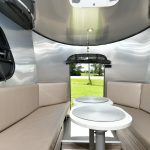 This tough little trailer brings the Airstream experience to a new generation of campers – it has been so well received that Airstream has built a new manufacturing facility dedicated to producing Basecamp models. 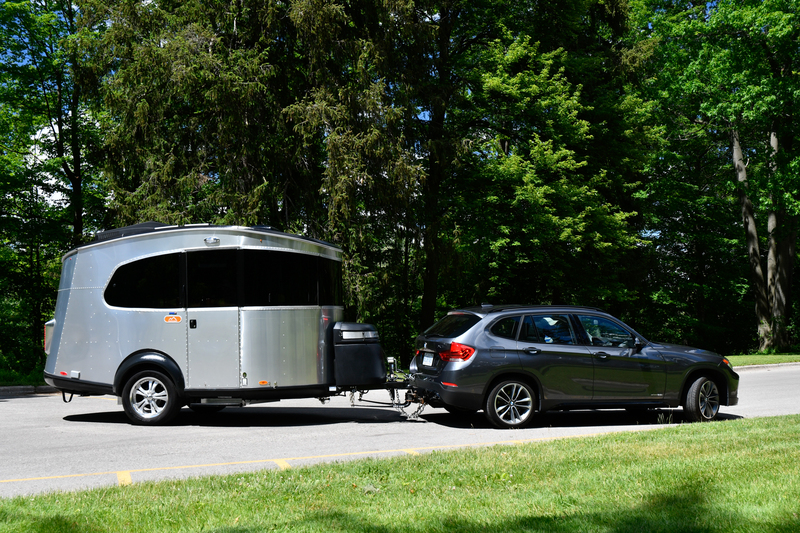 We towed the Basecamp through the winding hilly terrain of South-Central Ontario – our BMW X1 tow vehicle was an excellent choice for this compact, lightweight travel trailer. Compact, aerodynamic and easy to tow behind a wide variety of vehicles, the Basecamp is ideally suited for the family who enjoys the great outdoors, and travels to their destination in a compact to full size SUV. The trailer seats five, and sleeps two adults – you could accommodate two small children as well if you add an air mattress and sleeping bag. 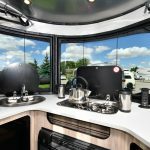 Build Quality – Airstream from top to bottom! 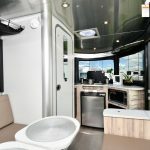 The classic Airstream “look” has shifted into warp drive for this 21st century trailer, with smooth lines and aerodynamics that enhance road handling. 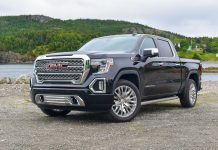 The semi-monocoque aluminum superstructure is strong yet light, and the exterior aluminum skin is riveted, just like the larger Airstream trailers, and the time-tested construction technique should provide generations of reliability and durability. The aluminum exterior is fluorocarbon treated for UV resistance, and there is a thermal barrier between the interior and exterior walls that insulates the interior and prevents the formation of condensation. The trailer features EcoBatt™ insulation for all-season comfort. Secondary battery storage and winterization bypass valve are standard. 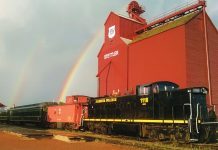 The roof profile has been designed to enhance aerodynamics, while providing a place to mount the twin solar panels, lumidome, and optional roof a/c unit. From the side, the roof profile is similar to the shape of the SUV roof styles, making this a very attractive and natural extension to the overall tow vehicle/trailer combination. 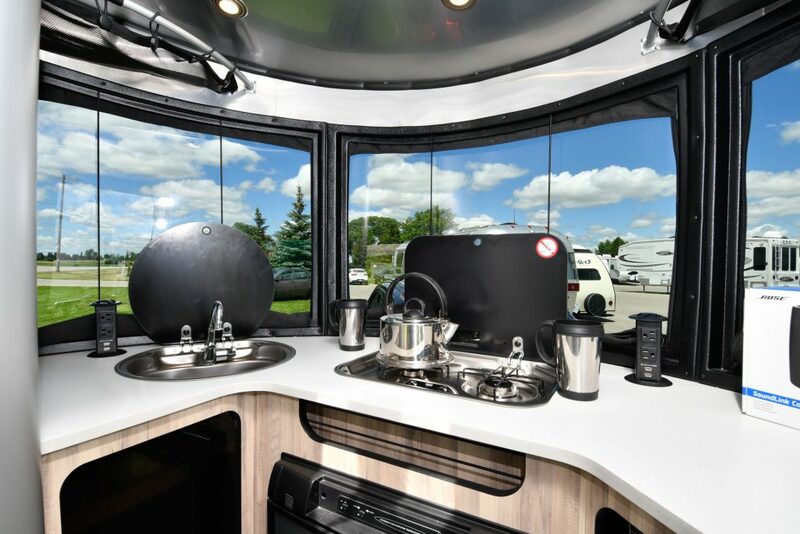 While many of the compact travel trailers lack sufficient window area, the Basecamp has a front panoramic window array that brightens the interior and gives you a fill view of your surroundings. The welded extruded aluminum window frames are hand-crafted, and the tempered glass windows are protected by a 3M® Film Front Stone Guard film, and tinted for style and UV protection. Blackout curtains let you darken the interior for sleeping of for additional privacy. Rear windows are tempered, tinted, and fitted with vent openings. 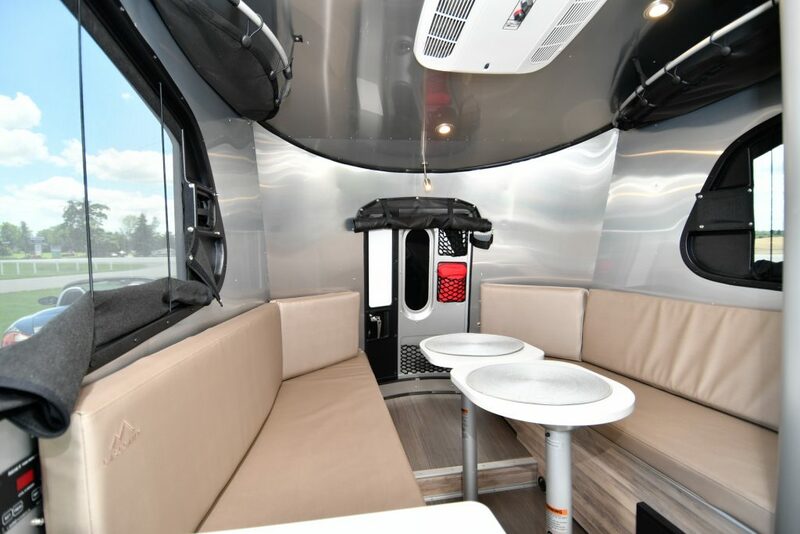 The Basecamp is outfitted with interior décor appointments that bring a space-age appeal to the unit. 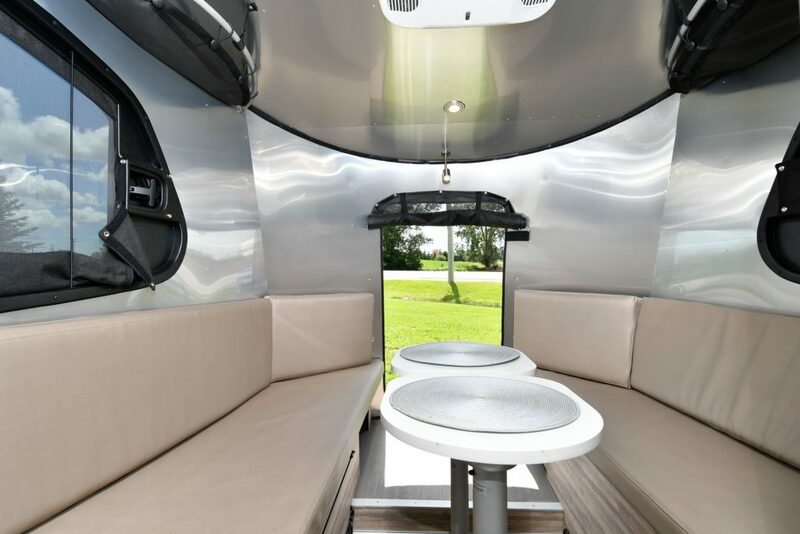 The interior walls and ceiling are, of course, Airstream aluminum, and upholstery and trim décor packages include River Rock, Red Rock and Warm Stone. All of the earth-tone colour schemes include durable, 5/8” WBP tongue-and-groove marine-grade wood flooring in a complimentary warm wood tone. Our test unit featured the Warm Stone interior. 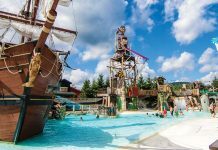 The Simtex™ Marine fabric used in the Basecamp is antibacterial, stain and mildew-resistant, and flame-retardant, assuring long wear and easy maintenance. With a compact lightweight travel trailer, setting up in a campsite is a breeze. 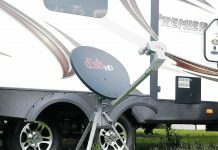 Just line up your trailer so that the electric, water, and sewer hookups are close to the attachment points, set your parking brake, chock your wheels, lower the stabilizer jacks, and you are ready to unhitch and level the unit. Arriving at night? 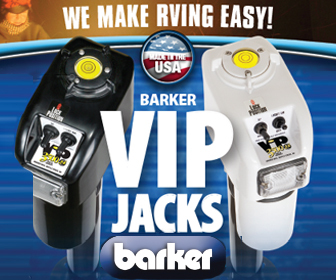 The Basecamp has LED lights in key places to help you hook up to the campsite utilities. 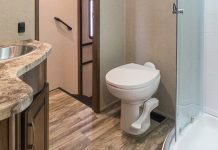 The Basecamp is a unique travel trailer, and it has a unique array of options to expand your campsite comfort zone. We were really impressed with the optional slide-in “visor” patio awning that can be installed to shade the side of the unit, the optional 108” x 72” fully enclosed patio tent enclosure that can be attached to the rear of the unit, and the 72” x 72” tent that attaches to the rear of the trailer. When you use both of these tent options, you can effectively add 120 square feet of exterior shelter to your Basecamp – perfect for sleeping outdoors or storing your gear. (Top Left)Flip up the tempered glass cover to reveal your two-burner cooktop. (Top Right) Flip up the other tempered glass cover and swing the faucet up to use your stainless steel sink. 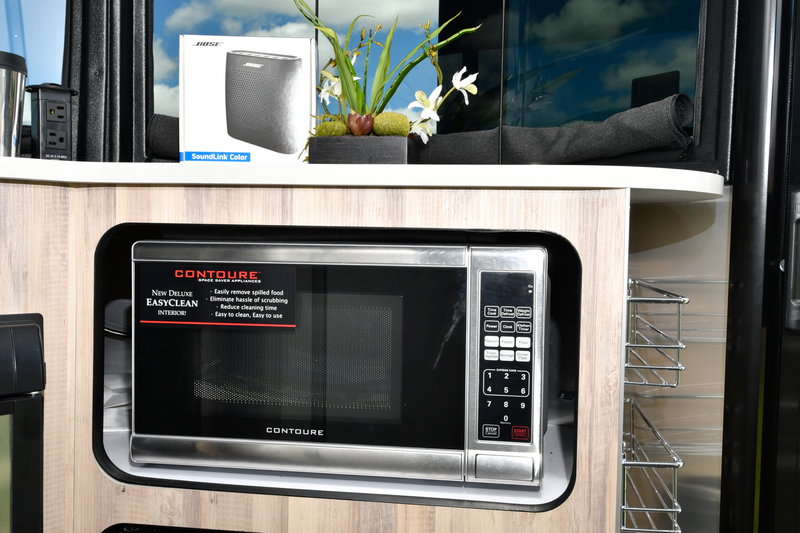 (Bottom)The optional microwave oven is ideally sized for a compact trailer. When you arrive at your campsite, it only takes a minute to transform the bench seats into a very comfortable sleeping platform. Posts stowed under the bench can be used to extend the width of the bed from a single platform, to a half width, or a full-width 76” x 76” bed. Twin dining tables can be used with short or long support pedestals, and the legs attach at the corners, so you can swing the tables around to use them across the length or the width of the centre aisle, and you can rotate them to enjoy greater legroom. If you want to entertain, you can use the two long benches and a short bench in front of the rear hatch to accommodate five adults for dinner. 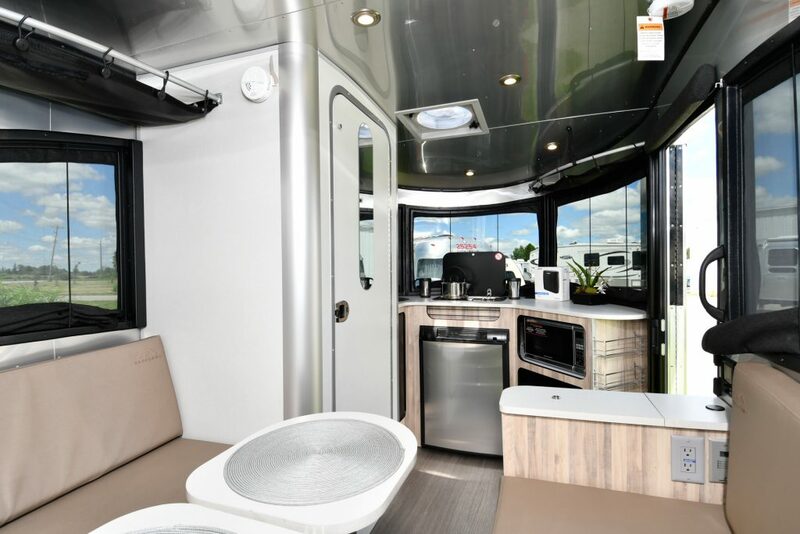 The Basecamp may be compact, but it offers two entry doors – the main door on the side features a sliding screen, and the 26“ x 46“ rear hatch features integrated mesh storage pouches and a removable screen. There is 126” of storage space inside the trailer – ideal for a canoe or kayak – and you can access this through the rear hatch. 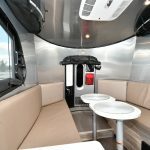 There are many unique features that reveal the degree of experience Airstream designers have applied to the Basecamp design. 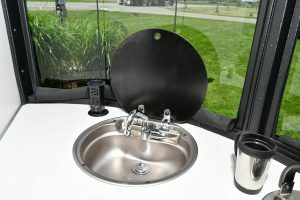 For example, when you need an exterior shower, the Basecamp has a pass-through port which lets you pull the showerhead through the shell of the trailer for use outside, and the showerhead has a shut-off valve for your convenience. Exterior storage in a unit of this size is always at a premium. The Basecamp provides a very clever storage compartment on top of the molded plastic LP gas tank cover over the twin 20-lb. 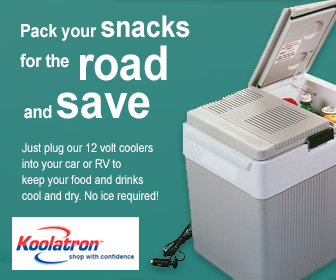 tanks that is ideal for stowing items like a power cord or a hose. For eco-touring “off the grid”, the Basecamp offers a standard pre-wire kit for the optional 160w solar package with upgraded AGM battery. The panels can be mounted toward the front of the roof, and/or in the centre. TRA Certification™ for the Basecamp is “Green: Emerald Status” This is the highest ECO rating assigned to RV products. A fully-equipped Basecamp trailer is ready to keep you comfortable wherever you roam, from hot desert climates to the frozen tundra. 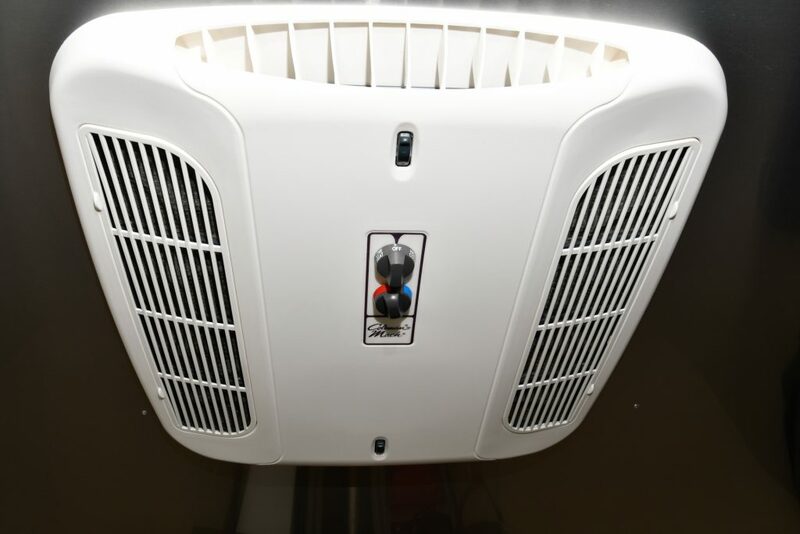 For cold weather camping, the Truma Combi Eco Plus™ 14,300 BTU heating system is the ideal solution – taking care of both your interior heating and water heating requirements. Select the optional QuietStream™ 9,200 BTU 30 AMP air conditioning system and you will enjoy interior comfort in the summer heat. 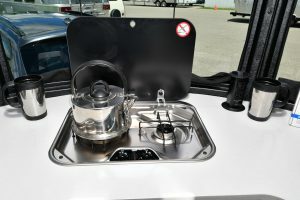 The trailer has an enclosed, insulated, and heated underbelly for all-season thermal protection, and the water tanks feature 12v tank heaters. The Basecamp takes advantage of every available interior space for storage. A support rod near the ceiling at the rear of the unit holds a fabric shelf, equipped with bungee cord type fasteners to stow your gear. We really like the way Airstream has outfitted the Basecamp with the modern utilities that let you enjoy your portable technology. The countertops have access ports so you can run power and charging cables from the power ports inside the cabinetry to the devices that you place on the countertop. The electrical outlets in the galley pop-up from the countertop, and drop back down when not in use. 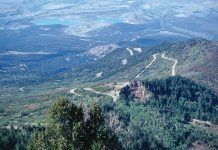 On the road, in the campground, or eco-camping in the boonies, the Airstream Basecamp is an attractive little trailer that should last for generations. The Basecamp galley features a two-burner LP stovetop, stainless steel sink, 2-way 3 cu. ft. refrigerator and optional microwave. Fold-down glass covers over the sink and cooktop let you maximize galley counter space. 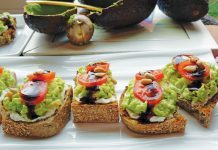 The cabinets are finished with Handcrafted Italian Lite-Ply® laminated surfaces, and they provide quite a bit of shelf space, as well as handy racks for small items, and there is a flatware organizer for your cutlery. You also have two overhead storage “shelves” that are reminiscent of overhead aircraft storage nets. There is a Fantastic© Fan in the front lumidome to help exhaust the heat and aromas of your gourmet cooking adventures. LP, smoke and carbon monoxide detectors are standard. 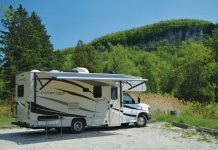 While a trailer of this size is essentially a multi-purpose “bedroom on wheels,” there are a few features that make the Basecamp a comfortable place to sleep when you are out in the woods. The large windows have vents to let you enjoy some fresh air, and the blackout curtains assure privacy. There are USB and 110V outlets so you can charge and power your devices, and you have a generous amount of under-bed storage with cargo area lighting. 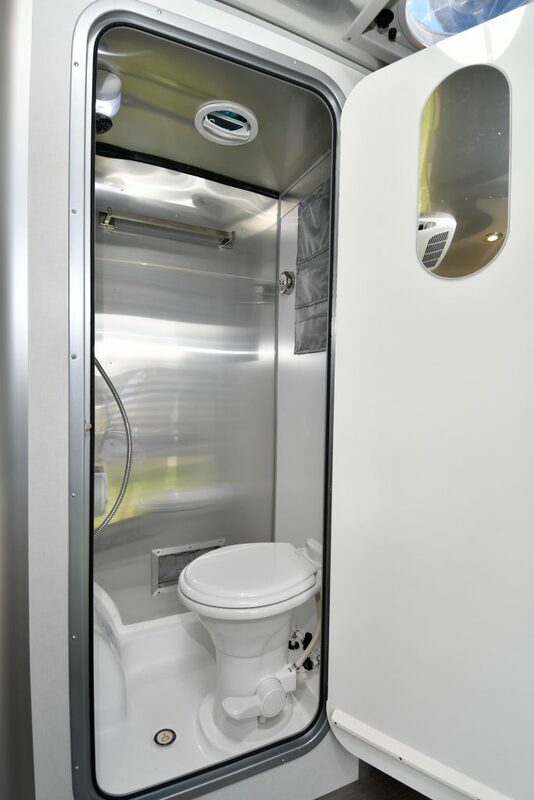 The bathroom in the Basecamp looks like it came right out of a modern airliner, but with a bit more residential flair. The standard porcelain toilet nestles into a compact yet surprisingly spacious area that doubles as a full shower stall. A ceiling vent and lumidome assure comfortable airflow and lighting is very good. The aluminum walls reflect the light, and there are mesh hanging storage pockets for your convenience. There is a clothesline in the bathroom, a perfect place to dry a few things after a day on the trails. 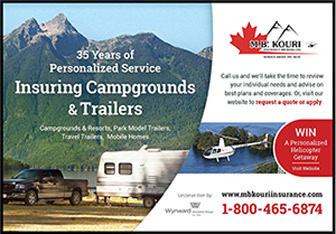 While the Basecamp is a premium price, premium quality travel trailer, it is built to last for generations, and should carry a very good resale value. 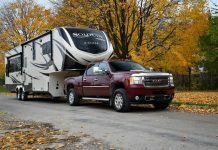 The trailer comes with a 2-year Airstream limited warranty that is transferrable, and there you have a 2-year 24/7 Coach-Net® Roadside Assistance policy. New Gear! Accessorize at your Campsite!